Erected by Donald Taylor in memory of his Mother. Helen Sinclair died 19th March 1876 aged 76. 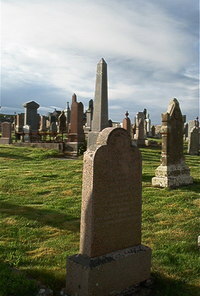 Son Donald Taylor died at Peterhead 19th July 1889 aged 46 interred here. Wife Ann Groat died at Fields Ulbster 13th December 1930 aged 92.